Hyperopia or farsightedness is a refractive error and is more commonly found in children but can affect anyone at any age. 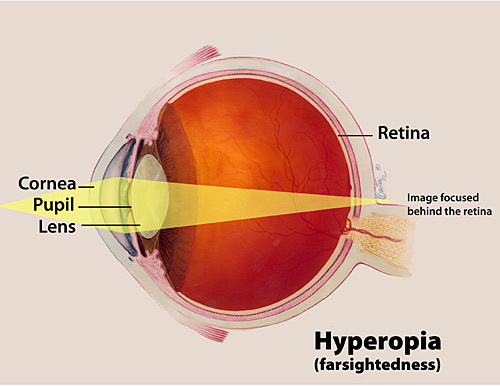 Hyperopia is caused by too little inherent power to the eye. This lack of power to the eye causes light to focus behind the eye which can cause a range of symptoms. A mild amount of hyperopia may go unnoticed and without symptoms by the patient. Moderate amounts of hyperopia can cause eyestrain, headaches and blur or fatigue with near tasks such as reading or computer work. More severe amounts of hyperopia will cause blur at all distances. Hyperopia is easily correctable with glasses and contact lenses and early detection in children is crucial in avoiding developmental diseases such as amblyopia and strabismus. Although only a limited amount of hyperopia is correctable with Lasik there are other refractive surgeries available for patients. Be sure and ask Drs. Folwarski and Hayes any questions you may have about your options during your comprehensive eye examination.